Boy has it been awhile since I last posted. Hello everyone! Apologies for the short hiatus I took recently, I've been really busy with school and college apps ever since August and haven't had time to work on posts until now. Did I ever mention how stressful senior year is? Well, it is. Also, unfortunately, my skin had one of its worst breakouts back in late June and didn't really start calming down until a month ago :( It seemed like I had a new acne spot every other day, so whenever I tried a new product, I had no idea whether or not the product was actually the culprit. Therefore I had to hold off on testing out skincare until I knew for sure that my experience wouldn't be skewed by whatever was causing my skin to breakout. Luckily, everything seems to be returning to normal now, except for the number of acne scars I have due to the breakouts, but only time can fix that really. I realized a week ago that I've never posted about my skincare routine, and that's for a silly reason- I kept waiting to find the perfect base routine. 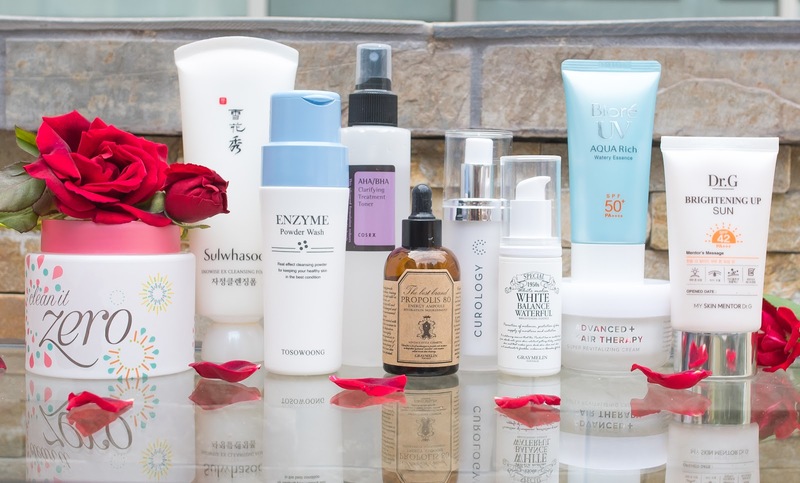 I thought that it'd only be acceptable to write about my skincare routine once I'd found all of my holy grails, but what's the point of writing a blog about my beauty journey if I don't include all the steps along the way? So today I'm going to show you guys my current skincare routine! I figured that this post would also be a good way to revisit products I've reviewed and to let you guys know "Hey, this product was actually worth repurchasing!" My skin can't really handle constantly switching products, so whatever I list below are the products I stick to until I run out or I'm sent a new product to try. Mind you there are some days I don't use all the steps, but that's only if my skin is a bit oilier than normal. Anyways, let's begin! First things first- cleansers. NEVER SKIP THIS STEP. There are rare days where I'm so tired that I skip my entire skincare routine, but cleaning is the one step I never skip. I've tried a good amount of cleansers over the past 3 years and I want to say that I've found my holy grails. Oh scratch that, I definitely have. 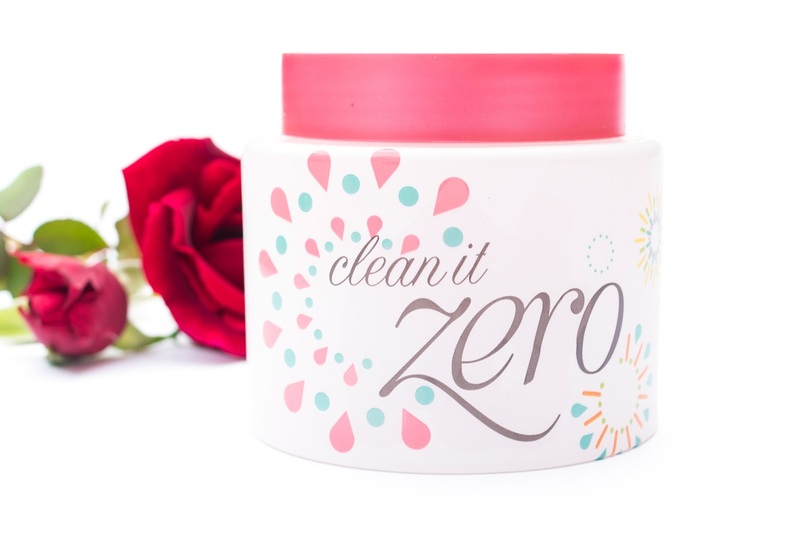 When it comes to first-step cleansers, which I use to remove all of my makeup at night, I always reach for my trusty Banila Co. Clean It Zero . This cleansing balm melts into an oil once rubbed onto the skin, getting rid of all the makeup on my face (even waterproof mascara!). It leaves my skin feeling soft and moisturized, unlike many cleansing oils I've tried. It also has an amazing cherry blossom scent! I've repurchased this about 3-4 times, and I don't ever plan to stop. Next, onto the second-step cleansers. 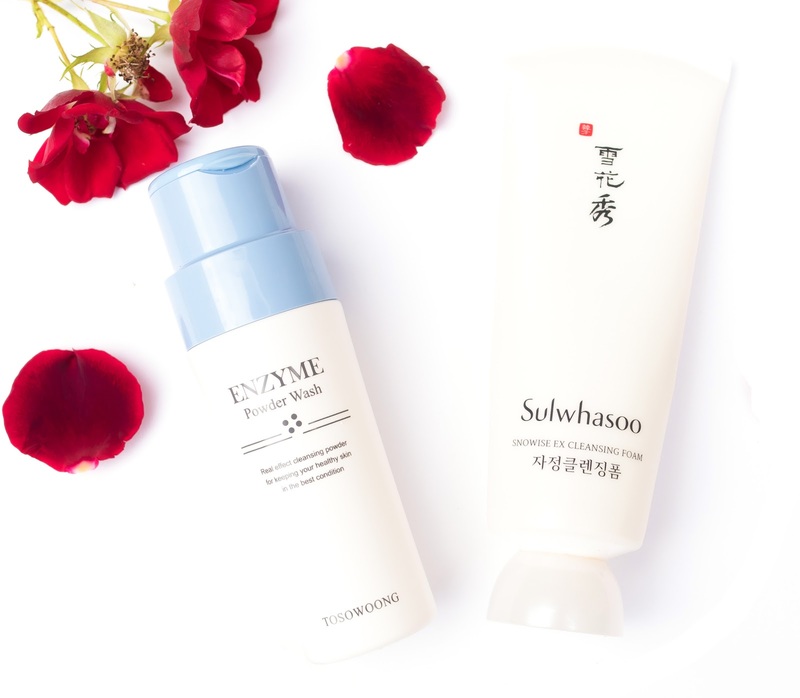 Right now I'm currently using the Sulwhasoo Snowise EX Cleansing Foam in the morning and the Tosowoong Enzyme Powder Wash (review here) at night. The Tosowoong is a repurchase, and I'd gladly buy it over and over again. It leaves my skin feeling smooth and supple thanks to its gentle exfoliating properties, and I've found that my skin texture really does improve as I use it. I'm on the fence about Sulwhasoo at the moment- on one hand I love how luxurious it feels on the skin, but on the other hand I'm not a fan of its price. I probably won't repurchase it after I use this one up because Tosowoong's effects are the same, if not better, as Sulwhasoo's. After cleansing it's time to use a toner. Right now I'm using the Cosrx AHA/BHA Clarifying Treatment Toner (review here), which is also a repurchase. 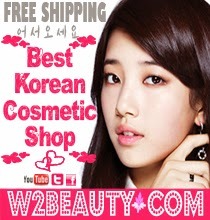 It really helps keep my skin from breaking out, and free of dry patches as well as any bumps from clogged pores. In my original review I thought that this wouldn't be suitable for the winter, but over time I've found that my skin doesn't like moisturizing toners which usually have a slippery feel, so I'll be sticking to lightweight, water-like toners all year long. I would repurchase this after running out, but I also want to try the Mizon AHA/BHA toner so I'll probably get that one instead. I highly recommend this if you have acne-prone, combination-oily skin. This step is only a part of my nighttime routine. Right after applying the toner on my skin with a cotton pad, I apply 2 pumps of my Curology prescription, which consists of 0.25% Zinc Pyrithione, 1% Clindamycin, and 4% Niacinamide. 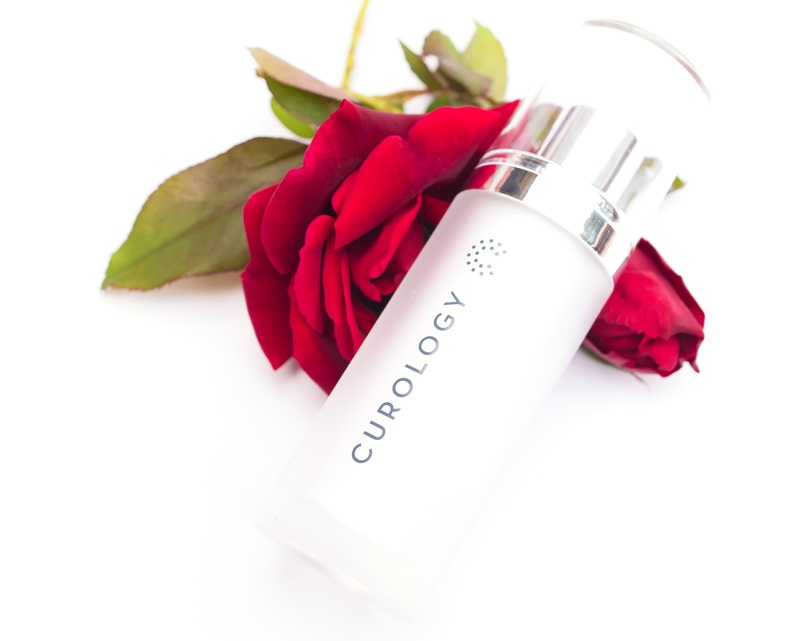 I've been using Curology since late July, and I think it's played a pretty big role in diminishing my breakouts. I'm thinking of changing my prescription though so that it's more potent for lightening acne scars, since that's currently my main focus. 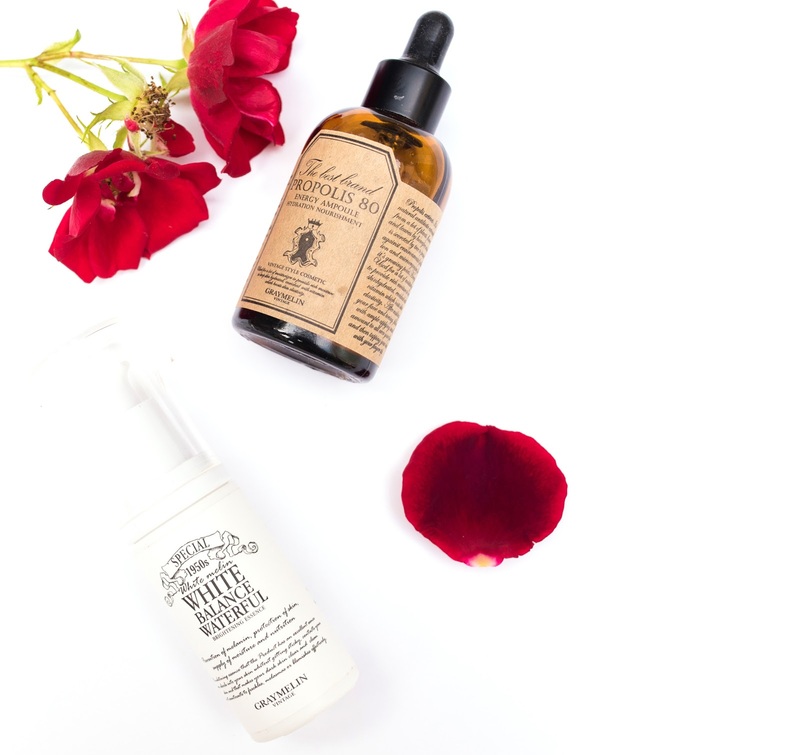 Moving on to the fun stuff- serums, ampoules, and essences. I use the same ones for both morning and night. I'm on my second bottle of the Graymelin Propolis 80 Energy Ampoule, but I'm hesitant to call this my favorite propolis ampoule yet. For those of you who have followed my blog for awhile, you'll know that propolis is one of my all-time favorite ingredients. I've been using propolis ampoules for a good 2+ years, and it really does make a difference to my skin by keeping it hydrated while soothing any redness and acne. The Graymelin one is very lightweight compared to others that I've tried, which I really like. 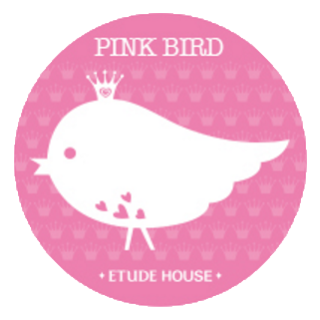 It's suitable for all skin types, especially sensitive skin, so I highly recommend it! Since I liked Graymelin's propolis ampoule so much, I decided to pick up the Graymelin White Balance Waterful Brightening Essence to try. No thoughts yet since I've only used this for about 3 weeks, but I like how lightweight it is. If I see any results I'll probably review this in a few weeks. 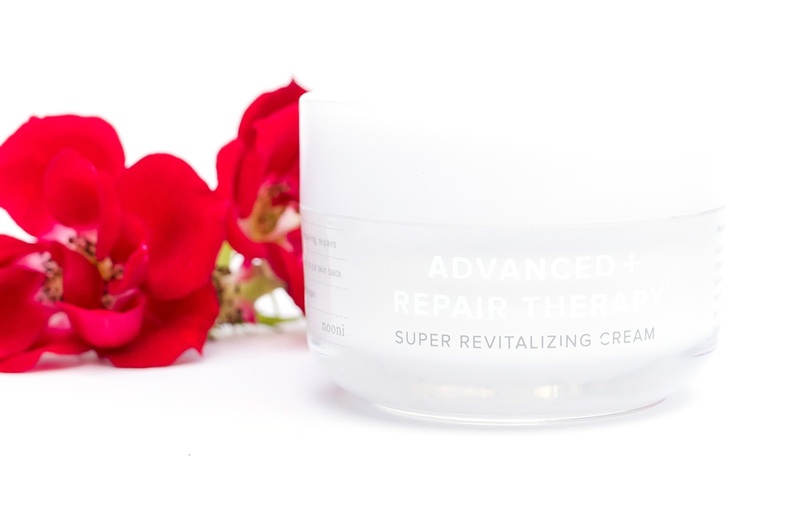 Next up is the Nooni Advanced Repair Therapy Super Revitalizing Cream, sent to me by Memebox. The balm-like texture of this cream is very similar to the Banila Co. Miss Flower & Mr. Honey Cream but not as thick. What's surprising about this is that even though it's moisturizing, it doesn't feel too heavy for my combination skin. I'm not sure if it's done anything for me other than moisturize at the moment, but I'll definitely report back with a full review in a few weeks! I use this both morning and night, although I do skip this step sometimes if my skin feels like it already has enough moisture. Lastly, an important step of my morning routine: sunscreens. Right now I'm currently switching between two, and honestly I love both so much that I can't decide which is better, so they're both holy grails for me. The Biore UV Aqua Rich Watery Essence is, as the name suggests, watery and lightweight. What I love about it is that it's PA++++, so it provides very high UVA protection. It's also slightly hydrating, but doesn't have a greasy feel like so many other sunscreens I've tried. I reach for this one on days when I know I'm going to be out in the sun for awhile, or when my skin is feeling slightly more dehydrated. 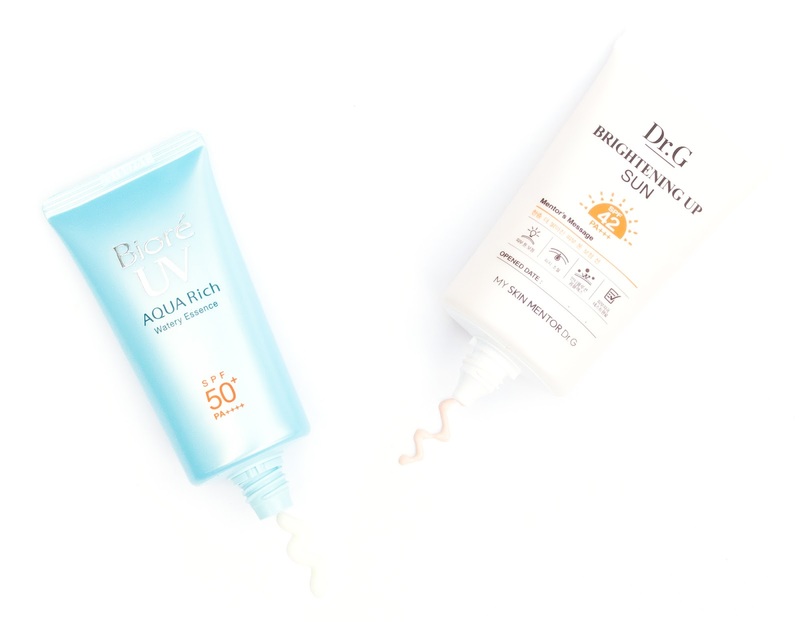 On the other hand, I reach for the Dr. G Brightening Up Sun when I'm looking for something to keep oily skin at bay. My skin doesn't get oily the entire day if I wear this without makeup, which is pretty amazing since my T-zone gets oily very easily. It does slightly brighten up my skin when applied, and it also doubles as a primer for me thanks to its satin finish. What's great about this is that it's not drying at all, despite of its sebum controlling ability, and doesn't accentuate any dry patches. I've tried plenty of oil-free sunscreens before (Shiseido, Lancôme, Benefit, etc.) but my skin didn't like any of those. This one though? It's the best I've ever tried. As for my nighttime routine, the last step occasionally is a sheet mask. For awhile I was using sheet masks every night and my skin looked amazing, which tells me I really should go back to doing that. Sadly though I don't have time >__< However, whenever I can, which is usually 1-2 times a week, I use a sheet mask at night at the end of my routine. Pictured above are a few new ones I picked up at Japantown last weekend. I don't have one particular sheet mask that I like, but I do have a soft spot for Taiwanese sheet masks as well as Korean. 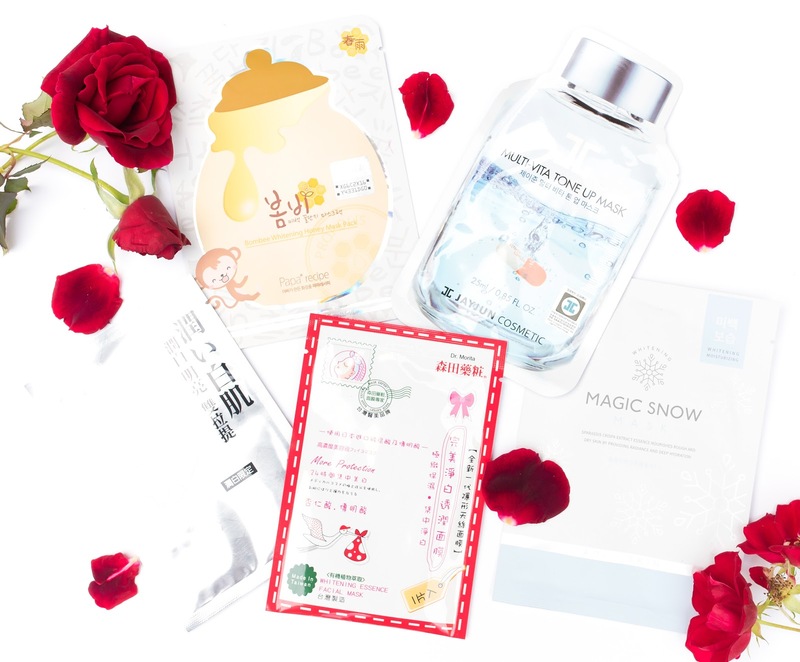 A few I can name right now are My Beauty Diary, Maskingdom, Papa Recipe, and Freeset's donkey milk masks, but there are plenty more. And that concludes my current skincare routine! It'll probably be awhile before I do an updated one, but I'll be posting updates on my Instagram (@gloriausdays) if there are any slight changes. 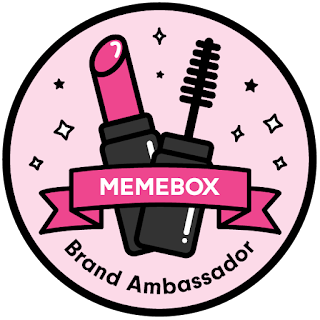 I'm going to try to post more often on there, so if you like to see mini reviews, favorites, empties, and hauls, make sure to follow! Also, please comment down below if you have any favorite skincare products, I'd love to hear about them! :D Let me know too if you'd like to see reviews for any products as well. I'll try my best to review them. Anyways, thank you for reading and I'll be back soon with a review!